The traditions of the America West’s historic cattle drives come alive at the American Chuck Wagon Association’s Championship Cook Off in Fredericksburg. Chuck wagon teams qualify by winning previous competitions across the U.S. The chuck wagon was more than just a kitchen supplying meals, it was the cowboys home on the trail, carrying everything needed during the journey north from Texas. Today, it is celebrated as the state’s official vehicle. Judges evaluate the chuck wagon teams on their wagons and campsites for historical authenticity, based on the cattle drive era from 1866 to about 1886. 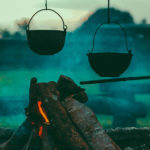 Teams must equip their restored or replicated wagons with period tools, cooking equipment, and all the other essentials need for life on the trail, from bedrolls and clothing to kerosene lanterns, tobacco, and shaving equipment. The next day, competition turns to what chuck wagons are most known for – their food. All teams have identical ingredients to use when cooking the competition fare: chicken fried steak, potatoes, beans, bread, and dessert. Luckily, visitors can enjoy a lunch of the same dishes served to the judging panel of food writers, journalists and local officials by the competing chuck wagon teams. For more information about the Cook Off, visit the American Chuck Wagon Association website. If you’re planning an April getaway to the Texas Hill Country to feast your eyes on bluebonnets, why not feast on a championship chuck wagon meal too? Stay at the Wine Country Cottages and Wine Country Farmhouse in Fredericksburg, and the Cook Off will be less than a 10 minute drive away. Just give us a call or go online to reserve your stay. This entry was posted in Events, Food & drink and tagged ACWA Championship Cook Off, American Chuck Wagon Association Cook Off, bluebonnet time, Cowboy Re-enactors, Fredericksburg TX festival, Texas Hill Country food festival by admin. Bookmark the permalink.